Are you just trying to become famous? You are next on the hate list buddy! Ol’ Ken is gonna get ya! Bet tons of people read that forum & immediately run to the water every week! After reading the article about the terrible things going on at the workshop, I am going to have to stop going. I can not allow myself to be associated w/such false teaching. I mean, who in their right mind would want to go to a place where the speakers are men & women who work at growing churches? I will have to look to something other than this venue. 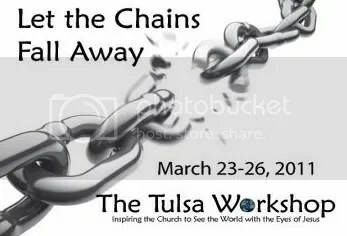 Where can I find a workshop with nothing but shrinking churches come together to rip apart the teachings of growing churches? This poor fella literally rewrites history. Although everything supports how the Church first divided & the path leading up to it all, he knows the real story & how it happened. At first I thought is was all a joke, but this guy literally puts hours into his post! He is serious! Be careful Wes, you will be named among Kingdom workers such as PMeady, Ricky Atchley, Max, Wade, & T Rush. I would hate for you to fall prey to such a thing! Peace be with you! You will need it for sure! I see, the way to deal with those who don’t like the changes at Tulsa is to make fun of them like they do those of us like going. Hmmmm. I’d be willing to sit in on that class. Seth – stop it. lol. Jeff – hopefully your school schedule will allow you to go. Be a trooper! Congrats, Wes…I know you’re going to be a blessing.